BE along with Trae Bodge* attended 2010's HBA Global Expo & Conference held at the Jacob Javits Center, New York City, NY. This year's show had more than 600 International industry suppliers and educational partners presenting their newest products, innovations, and expertise. What did we come away with this year?...excitement and insight on how to reach a customer who is heavily influenced by a digital revolution that causes a chain reaction of speed. Speed to connect, speed to express and speed to change is an exploding LifeStyle that we're just now starting to understand. The challenge for us as product developers and marketers is to align with, and draw from, a consumer who wants to be part of the creative process. She demands convenience with choices at her fingertips compounded by the need of emotional connection. Because she expresses an uninhibited opinion of what fits her needs at the moment, our relationship with technology begs us to engage with the consumer at a personal level. Roben Allong, key Marketing Strategist from RealityCheck Consulting Network, LLC presented the latest update on The Millennials. According to Roben, Millennials or Gen Ys are that key audience referred to as the Net generation. According to some marketers, they don't remember a time when the Internet did not exist! They're deemed to be the most technologically savvy generation to date.
. Encourages Socializing 24/7 + information gathering + giving an opinion. . Builds Community thru Technology via Beauty Blogs, YouTube, Facebook, MySpace.com, etc. . Sees creative equity as valuable. . Allows for sharing information about themselves and others at an unprecedented comfort level.
. They are the "Me" Generation. They know themselves and focus on their individuality. . Personal information sharing is viewed as a life benefit that builds friendships and reputations as well as establishes communities. . They are more involved and take on more responsibility, which helps them gain insight to express themselves in a more creative way.
. Micro-market to small niche groups and their online sub-networks. . Invite them to be creative in helping define what your brand is, what it can be. . Parallel their point of view. Communicate what the brand stands for on a local level to increase traction . Help them connect and stay constantly connected with others in mobile and multiple locations: their homes, social settings, on-line, at work. . For them, life is an expedition. Be the brand that helps them enjoy the expedition and make it more meaningful for themselves and others. Contact Roben at robena@realitycheckinc.com for a copy of the presentation and a more in-depth explanation of Who They Are and What is to Come for this generation. Reported below are color cosmetics and skin care needs for the evolving woman. Excerpts from "What She Wants" were captured from Peggy Lee, AVP of Creative at Maybelline on women ages 14-20 and Karen Young, CEO of The Young Group, on women 50+. She is experimental She likes makeup that is portable. She favors brightly colored and shimmery shadows. Foundations should have light coverage and a matte finish. She prefers lip products very colorful but sheer. She favors skin care with a light texture that helps to treat blemishes. She is experimental but is beginning to form cosmetic purchasing habits. She is most likely a career woman and will spend a little more on herself. Colors are fun but also practical. Multi-functional products with long-wear benefits are key. She prefers foundation and lip products with light to medium coverage. She favors skin care that is easy to use with the added benefit of SPF. She is more well-rounded and less likely to respond to trends. High performance, nourishment and long-lasting cosmetic formulas benefit her needs. Colors are more conservative. Medium - Full coverage foundation and lip products are necessary. She is harder to capture because she has already formed many of her cosmetic purchasing habits. She has moved from products that "protect/preserve" to products that "repair/enhance". Her skin is thinner and tends to be drier. Products must offer intense moisturization, cell-regeneration, collagen/elastin rebuilding and soothing ingredients. Products should treat redness and offer sun protection. Full coverage foundation and lip products are necessary. Susan Akkad, SVP Corporate Marketing, Diversity, noted that 1/3 of the US are people of color, so in reality, Women of Color are becoming the new mainstream". She advised that when considering the ethic customer, that we remain aware not only of her skin tone and needs specific to her skin type, but to her culture. For example, when you are addressing Latina's, consider how you can market to her in a way that resonates with her "Latina-ness" in concert with her "American-ness".Black women, on the other hand, are often coming from a matriarchal place they are in charge and tend to feel strong and confident. She must be spoken to with this in mind. Cheryl Wilson, Marketing Director of Fashion Fair, provided stats that drove Ms. Akkad's position home: Black women are spending 9 billion annually on their beauty products and this market is growing 5xs faster than the general market. Latinas are not far behind, spending 6.8 billion annually. Ms. Wilson also addressed skin tone from a technical standpoint by illustrating how women of color have different needs due to a higher level of melanin. More melanin, while protecting the skin from some sun damage, also makes the skin more reactive to certain ingredients, more susceptible to seasonal changes and therefore, unpredictable. Skin of Color has over 35 variations, where Caucasian skin generally has under 10, which makes providing an adequate range of skin-toned products very challenging from a SKU standpoint. Ms. Wilson advises that in order to address the needs of Women of Color, you must deliver a large range of shades, provide innovative - yet easy to use - solutions for the unique needs of Women of Color, while still portraying an authentic and varied beauty representation. Lubna Khalid, Founder of Real Cosmetics, said, "What Women of Color want from their beauty products is to be included; to find the right shades to match their skin tones; to be represented and included in imagery and advertising so that they can see themselves reflected. Imagery that is attainable and real and makes them feel beautiful. They want to trust the company, trust the claims and feel good about the products. Women want a company that cares, not only about them, but that makes a difference in the world. All women are beautiful and we can help make them all feel that way. Every so often there is a special story behind the making of a scent. And so it is for this year's 2010 HBA International Package Design Award for Bella Una which translates to "Beautiful One". The fragrance won against industry moguls including Sephora and L'Oreal. Looking deeper into the brand, one will soon discover a history of greatness. Bella Una is deeply rooted from the idea that all women should believe in themselves and that everyone's differences is what makes them unique and beautiful. The winning signature scent is different from all of the others that are soon to launch. It is inspired by the creator's fondest childhood memories and contains a "love letter" written to the creator's mother; reminiscent notes in the scent connote tantalizing smells coming from the kitchen and tea parties with her friends real and imaginary, and is comprised of affectionate, comforting notes that warm the heart and inspire a smile. Beyond the fragrance, Bella Una's unique nature is in its presentation that begins in a sustainable mulberry bark box. Nestled within the box is a handwritten love letter found in an envelope sealed with a natural pressed flower. 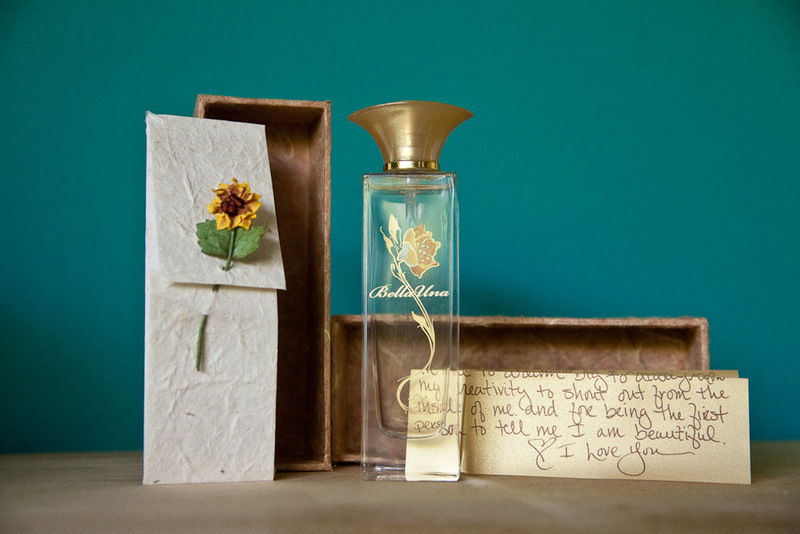 The letter rests on top of an exquisite bottle that contains the inspirational fragrance. Newly launched scents will be assigned a female's name and will have qualities that lend an idea of where â€œsheâ€ came from in the love letter. Each name will tell a tale and have a journey, always creating a persona rich with romance and love. Jamie Ross, Creative Director of The Doneger Group, presented a comprehensive guide to expected seasonal fashion/color trends for 2011. Fashion - Vintage sensibility, referencing the 50's and 60's. Fabrics - Soft, ladylike and ethereal. Antique lace and youthful styles will be prevalent. Colors - For clothing and makeup; pinks, lilacs, grays and soft apricots. Finishes - Almost chalky or velvety. Fashion - Daring and impactful in their prints and color direction. Patterns - Painterly brush strokes, stripes and polka dots. Colors - For clothing and makeup;Â bright and bold, yet grounded by browns and dark purples; lots of bright colors on eyes and/or lips. Finishes - both matte and glossy. Fashion - Casual and utilitarian. Fabrics - Lots of denim, leather and shearling. Colors - For clothing and makeup, dark, inky blues that are softened with taupes or browns and accented with coppers. Finishes - Almost imperfect. Fashion - A sense of heritage with a touch of the "haughty and naughty" with equestrian styles, tweeds. Fabrics - Leathers, faux furs, suedes and brocades. Colors - For Clothing and makeup, port wines, purples and berries, accented with metallics. Lips will be dark with subtle eyes. Finishes - Dark and suede like.
. Ecommerce - The internet will influence more than 50% of retail sales by 2014. Forrester . OnTheGo (Mobile) Commerce - 37% of smart phone owners purchased $1.2B in 2009 . AtHomeParty's - $28B total sales 2009 . FromHerCouch - Over $10B in sales via TV . Factory Outlets - By 2012, Saks, Neimans, Barneys, Nordstroms & Bloomingdales will have more factory outlets than traditional stores . VenderSpenders - Vending machines provide instant gratification on the go. Currently flat irons, caviar, books, gold bars, meat and beauty products can be found in vending locations. Donna Tarantino-Loyle, Director of Health and Beauty at Shop NBC, addressed the increasing relevancy of direct-to-consumer sales. 10-12 years ago, this medium was largely ignored by prestige brands, but it has progressively become an opportunity that brands consider seriously. With lives that are increasingly busy, many consumers will have even less time in 2011 than they did in 2010 to shop in stores.Â Television sales can reach the consumer at home allowing a brand to present a consistent, controlled message and experience.Unlike in-store, a brands message can be diluted. With features like auto-delivery and easy-pay, the shopping and fulfillment is made that much more convenient. Couple that with an avid online community, women will still be able to feel connected. Howard Kreitzman, VP of Cosmetics and Perfume at Bloomingdales, shared what Bloomingdales is doing to stay relevant. With the recent redesign of their 59th street branch, Bloomingdales is successfully addressing the needs and preferences of today's consumer by creating a unique and memorable experience allowing her freedom of choice on how she shops. They have also partnered with Space NK installing mini Space NK outposts in several locations as a way to feature niche brands. Retailers could certainly take a page from the Bloomingdales playbook in 2011. Maria Sansotta, Marketing Director of Tarte, cosmetics outlined their social media strategy. She encourages brands to truly embrace social media by creating an online family and keeping them up to date on news and events. She also advised that brands regularly thank their customers with special discounts and offers and keep them informed by providing regular video how-to's. Karen Young informed us that the U.S. is only 47% of the world market. Brazil is the #2 hair care market in the world, after the U.S.; India and China are players to be addressed seriously as well. Her suggestion was that brands should first establish themselves in their country of origin, and then tailor their international approach to each country they are targeting.
. Due to busy lifestyles, multitasking, one-hand application and TSA-approved sizing (for air travel) will continue to be attractive products for on-the-go consumers.
. Reconnect with the consumer and identify her needs.
. In a troubled economy, the consumer is more conservative - she is "de-stocking", which means she is using up what she has at home and will only buy products she feels she truly needs.
. Focus and streamline products and their messaging to remain relevant.
. All brands have the same access to technology and packaging, focus on the targeted consumer and be authentic in brand messaging.